CD1 All tracks; CD2 Tracks 1-2:: The Town Hall, Birmingham, West Midlands, England. February 11th, 1970. CD2 Track 3: Akademiska Foreningens Stora Sal, Lund, Sweden. March 20th, 1970. CD2 Track 4: Audimax der Technische University, West Berlin, West Germany. March 13th, 1970. Hissier than the Harvested release. This is the first time (that I know of) that this significant show has been available on cd. This show is significant for several reasons. 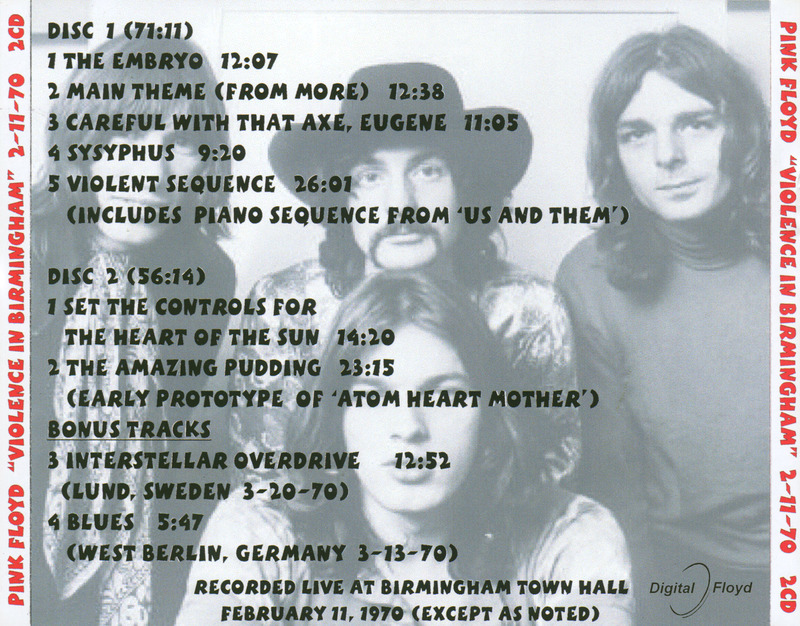 First, it contains a very early performance of Atom Heart Mother and Embryo (I had not realized until just now that Embryo had its concert debut at the same time as AHM, plus or minus a show or two) This show would be around the 10th or so performance of each song, so it's interesting to compare these early performances to later ones. The second reason why this show is so important is that it contains several rarely performed songs; Sysyphus, The Violent Sequence, and Main Theme (from More). Each of these songs had only a handful of performances. 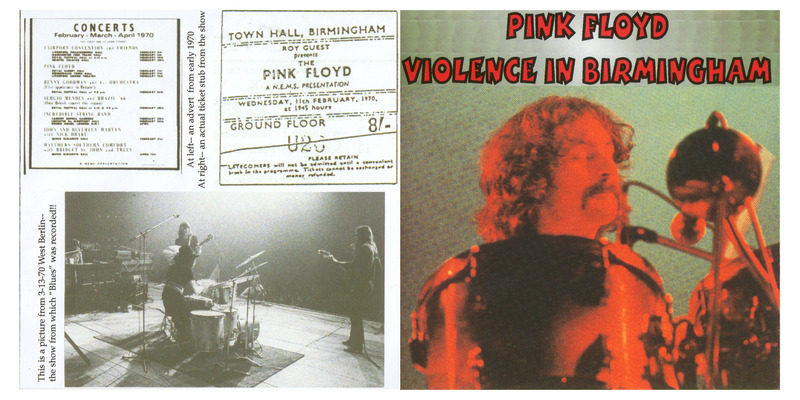 The fact that all three were played in Birmingham is significant, especially since there are only two documented shows where this occurred. It appears that this show was the final performance of Sysyphus, as well as one of the last for the other two. The Violent Sequence was given a very lengthy performance, at 25:32 minutes (probably its longest). The March 13, 1970 Blues is one of the earliest performances of this song. I'm not sure if anyone else but me cares about this sort of information, but I just love it. 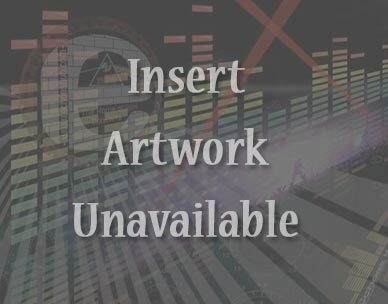 The recording quality is not very good, though it is not so bad that it is unlistenable (sound quality was NOT factored into my Excellent quality rating). It sounds a little muffled at times, though at other times sounds quite good. Interstellar Overdrive (from another show) appears to have the best sound (plus a really good performance), and Blues (again from a different show) the worst. Blues is slower and a little heavier than the other versions I've heard. At this point of AHM's development (then called The Amazing Pudding), there was a drum solo featured at the end. This version has a two minute drum section before the source cuts off. Some songs appear to be cut off slightly at the end, though nothing too bad. Also, there is drop in high frequencies when the vocal section of AHM begins and which seems to last the entire section. The result is a very muffled sound that makes the vocal section hard to enjoy.